So, what's the latest then? As the photography work continues to grow, a new website has been created dedicated to promoting that side of the business. The new site, www.cameraflair.co.uk includes multiple slide shows on the home page to showcase the wide range of work & capabilities. ECG operate a number of homes throughout the UK offering a full range of Care Services from Residential and Nursing Care, dementia, (or memory care), autism, learning disability, physical and mental disability as well as a wide range of other specialist services. Eastgate Manor at Mickley Gate near Stocksfield, is the newest of the 26 homes in the chain & due to open shortly. With a specialism in dementia care there was a requirement for local images to be made into large wallpaper coverings & Key Skills shots were selected. The new home is due to open in May 2011 & Richard has been invited to the Open Day. Despite being unwell on the day, a Key Skills pupil bravely took his London College of Music Grade 6 piano/keyboard examination at the Sage recently rather than cancel. The courage of the Prudhoe Community High School pupil really paid off as he gained a Merit with 77% & was not far off achieving a Distinction - a distinct possibility if he had been 100% fit. Taking such an advanced Grade always requires plenty of hard work, especially when the student is also in the middle of academic exam studies too! The Merit has also earned him the bonus of valuable UCAS points for a University placing. He has also already bought the Grade 7 study material & can't wait to get started when he gets back from Italy where he is performing with a swing band. Lucky Italians! The ‘If we can, you can’ supporters of entrepreneurship have been announced today, following the unveiling of the ‘If we can, you can’ Challenge winners two weeks ago. 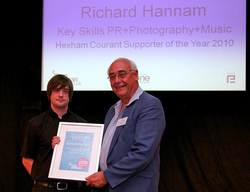 Key Skills owner Richard Hannam, who was nominated by David George, has been chosen as the Hexham Courant’s ‘Supporter of the Year’ recognising the guidance, inspiration and support he has given David and his business, Process Auditing Services. Now in its third successful year, the ‘If we can, you can’ Challenge added this special tribute in an effort to recognize those who support entrepreneurs as they aim to build successful businesses across the region. Among the nominations were inspirational family members, key figures from the region’s support organizations and fellow entrepreneurs who have provided the entrants with the crucial support needed to keep following their dreams even during the toughest of times. Carole Beverly, CEO of the Entrepreneurs’ Forum said, "Congratulations to Richard for being chosen as one of the ‘If we can, you can’ Challenge’s ‘Supporters of the Year’. We introduced this new accolade because we believe that it was vital to recognise and reward those who have had an active role in supporting entrepreneurship and helping businesses to grow in the region." If We Can You Can has now over 820 members and dedicated 112 mentors. The community encourages people to share their stories, offering budding and aspiring entrepreneurs the opportunity to tap into a wealth of experience of people who have ‘been there and done it’ by exchanging experiences and creating connections. ‘If we can, you can,’ aims to actively address the region’s current business shortfall by unlocking the entrepreneurial potential among the general public and is driven by the Entrepreneurs’ Forum and funded by One North East. Most families love to have treasured photographic memories of their loved ones - both old & young - in groups or as individuals. And don’t forget the family pet! Traditionally, this has involved a visit to a professional photographer’s studio with all the associated costs, risks & limitations. Key Skills offers the alternative of having these important & personal photographs taken in the comfort of your own home. "This approach provides a number of benefits," said Richard Hannam. "None of the travel risks, time & costs of visiting a studio; photographs taken in familiar surroundings & natural lighting; the family pet(s) can be easily included and/or photographed separately; access to changes of clothes, familiar items (& make-up of course!) & lower costs." What about quality? Certainly, the controlled environment of a studio provides the potential to produce shots of the highest possible standards. However, the natural & warm ambience of the home surrounded by familiar items, plus all the other benefits above, has the potential to deliver even more pleasing results.These services don’t have to be limited to traditional portraits either. Some photography just can’t be done in the studio. Special events such as that dinner party with old friends, engagement celebrations, birthday parties & many others are all possible. "But there are also those events outside the home such as, for example, the school prom, presentations & sporting events," said Richard. "The occasion is only limited by your imagination!" Examples of family & pet photography can be seen in the galleries. In addition to advertising & golf work, new assignments for weddings & other types of people photography have been added from March starting with a Mothers' Day shoot at St John's Church in Greenside. Since then the weddings have followed & the visit to Prudhoe of HRH Duke of Kent. Samples of these shots can be seen here but all recent work can be seen at the Key Skills photo galleries. Key Skills has built a new website for Ponteland based Process Auditing Services (PAS) in record time. PAS Principal, David George, had spent several months talking to designers & making no progress. "The delays & the prices quoted were very frustrating," said David. "I met Richard at Key Skills in February & my new site was published in March. Richard also dealt with the content & photography & subsequent marketing. Not only was the site created very quickly, it was also achieved at a fifth of the lowest quote from other suppliers." This news follows the announcement of Key Skills 'fast track/low cost' website service earlier in March. "The contract with PAS demonstrates my new service is beneficial to SME's," said Richard Hannam. "David's co-operation throughout was excellent & demonstrated his own professional skills in managing a quality process." Small to medium sized businesses need a website but the costs, time & completeness of service can be a real issue. Key Skills has developed a new high speed, low cost website creation service that includes content, photography & web marketing too where required. The result is a new site in days, rather than months, with no ongoing costs either! An existing site can also be reviewed. "I've often found sites full of spelling mistakes, grammatical errors, inconsistent business messages, missing information, irrelevant content & other problems" says Keys Skills owner, Richard Hannam. "That really doesn't send out a positive message to employees, customers & suppliers." Thursday 18 February 2010 was a big day for Prudhoe based Key Skills Music when 10 year old Joseph Torre received the school's 5000th piano lesson. Joseph, from Newcastle, has been a Key Skills pupil since October 2006 & attended over 120 lessons. "When I gave the very first lesson on 9 September 2003, I never dreamed I would give another 4999," said Principal, Richard Hannam. "I'm really enjoying learning the piano," said Joseph. "Richard makes it easy & a lot of fun!" "I am delighted for Joseph as he's been a great pupil for over 3 years. And you should hear him play the James Bond theme! If it hadn't been for a late re-arrangement, the honour would have gone to another student." "I'm very proud to have reached this 5000 lesson milestone but I would sincerely like to thank all of my loyal pupils, both past & present, for making it possible." Joseph & stepdad Greg (pictured on the Home page) received a card & some gifts to celebrate the occasion. All the other pupils also received a thank you card & a gift. A Key Skills photograph has been selected as the cover shot for the February issue of Golf North East. This is the second time following selection for the cover in August 2009. It's also the third magazine cover shot in less than a year as the Tyne Valley Express used a Key Skills photo for their May 2009 edition. Tynedale's Hexham Courant, the highly popular weekly newspaper covering 44,000 readers in the Tyne Valley, has published a feature article on Keys Skills' activities. You can see the full article here. In 2006, the 16 golf club Captains in the Newcastle & District Golf League formed a Society to foster the friendships made during the year. Key Skills has created & launched a web site for the Society. The new site has been well received by the Captains & can be seen here. 27 Dec 09 - New web site launched. Having just used a Google blog site for many years, Key Skills has created its first dedicated web site. Following the launch, a number of the company's contacts were emailed & asked for their views. Everyone's first impressions were that the site was excellent. However, some did provide some very useful suggestions which have been incorporated. Visitors are encouraged to visit often & see how the site is developing. Close Hosue Golf & Country Club is building a fabulous new championship golf course - The Colt. A couple of Key Skills photos of the new course have been used on the Close House web site. However, one of the photos was also selected as Photo of the Month for the December 2009 issue of Golf North East. The Colt course photos can be seen here. It all started with a front cover shot earlier this year. Since then, the relationship between the Tyne Valley Express & all sections of Key Skills has continued to grow with regular photo assignments & a column in each issue. Managing Editor, Robert Greener's daughter is even taking piano lessons! Distributed six times a year to over 60,000 residents all along the beautiful Tyne Valley, the magazine's 7th issue has just been released. It's unique approach has proved very popular to readers & advertisers alike & has already doubled in size to 64 pages. Key Skills is proud to have played a part in the Tyne Valley Express success story & aims to build on that in 2010. 22 Oct 09 - Key Skills photograph on National TV. The giant seagull photo that appears on the home page was shown at the end of News At Ten & then on GMTV the following morning. I'd been watching a news item about the giant Australian seagull that appeared on the window sill behind a news presenter. So, I thought to myself, "I know where there's a bigger one." and emailed it in immediately. Although my shot had an element of luck, I did beg a bag of crumbs from a passing picknicker & took around 200 shots during an hour or so. One of the ugly faces of this recession is personal financial hardship & the desperation it causes when important bills cannot be paid. What better way to make things worse than to borrow money at exorbitant interest rates. 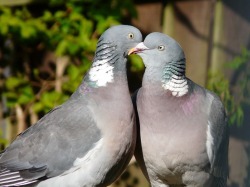 Wonderful, the bills are paid & all is well until the money has to be repaid & the next load of bills arrive. Desperation causes this never ending spiral into financial disaster, not just lack of knowledge. Regrettably, there is a rise of companies out there, without a conscience, who are prepared to exploit the desperate & ill informed. They sell small loans with charges that appear deceptively small until the interest rates are calculated. One such company, Quick Quid, advertises their loans on TV where happy & smiling customers tell you how wonderful it is to have been able to pay the bills - courtesy of a typical annual percentage interest rate of 2356% Well, after all, TV advertising isn't cheap & has to be paid for somehow. Was this rate of interest my calculation? No, it was clearly displayed at the bottom of the Rates & Terms section of their web site. Selling your soul would be less expensive. The If We Can You Can Challenge, in association with the Entrpreneurs' Forum has given a category award to Key Skills. The results were covered in various media including the Hexham Courant, Tynedale's highly popular weekly with 44,000 readers. Yuo can see the full article here.